The land on Groby Lane was purchased by the Parish Council in 1955. It opened for burials in 1960. In 2017 the extension was opened and is still being landscaped in 2019. 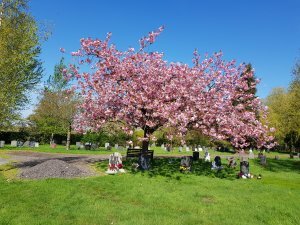 Anyone wishing to donate a tree in memory of a loved one should contact the clerk. All offers are most welcome. 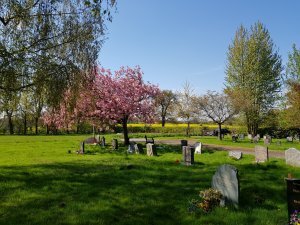 The Cemetery is open to all Newtown Linford Parish residents. At the discretion of the Council plots may be available for former residents or relations but the fees will be double - see the fees sheet. Please email to the Clerk who will issue the appropriate Invoice for payment preferably by online banking. 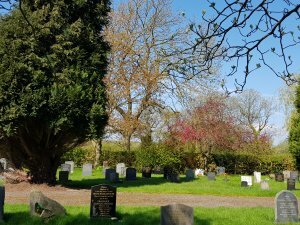 Visiting the cemetery - parking details and how to gain vehicular access. Charnwood Borough Council Traffic Wardens are visiting the lay-by outside the cemetery regularly and issuing parking tickets. 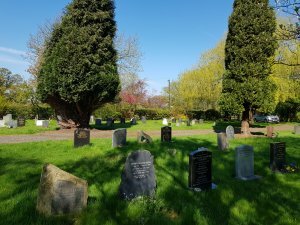 If you have a blue badge you may park there provided you show your badge and are visiting the cemetery. Both large gates now have coded padlocks on them. Each entrance has a side gate which is not locked. The code can be obtained from the Clerk, The Clergy or any Parish Councillor. If you use the code, please remember to scramble the number afterwards. Further information can be obtained from the Registrar for Burials Pam McMorran - shown as the Clerk at the top or bottom of the page.